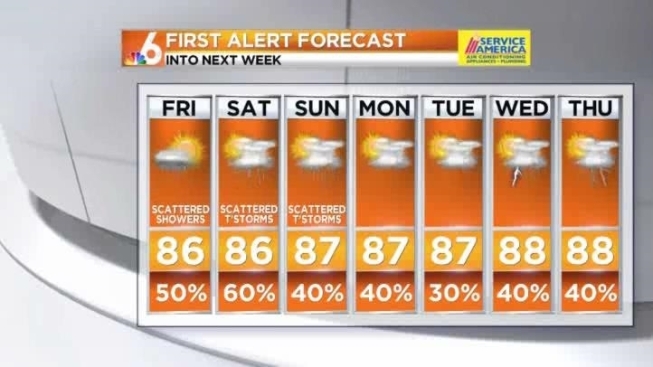 The South Florida weather pattern continues to bring shower chances each day through the weekend and into next week. With the lack of dry air moving in, a front or strong high pressure cell to clear us out, our unsettled pattern continues. Best bet, be ready for showers at any time, rewarded with some pockets of sunshine. Otherwise it's another breezy forecast for Friday with highs around 86. Showers will be possible overnight as temperatures stay around 76. Saturday will be partly sunny with scattered showers and thunderstorms and highs around 87. Sunday will be partly cloudy with scattered showers and isolated thunderstorms and highs again around 87.